Use viral alerts to identify top performing content your news organization posts on social media so you can optimize for greater impact. You'll discover the posts that are resonating with your audience, which will help you decide what you should boost, cross-promote, or put behind a paywall. This also helps identify and improve social content strategies so that your social budget is spent effectively. Train your sales team on how to use CrowdTangle. Consider us consultants, and give the team in front of potential clients access to our Intelligence tool for the ability to track clients and prospects. Here's how one station did it. Go deep on your page, with clients, or with your competition using Intelligence. This can help you see what formats and strategies work on your page, and help you identify a post type you've neglected or over-optimized. Also compare yourself to your competition to see if they've found more success with their posting strategy. 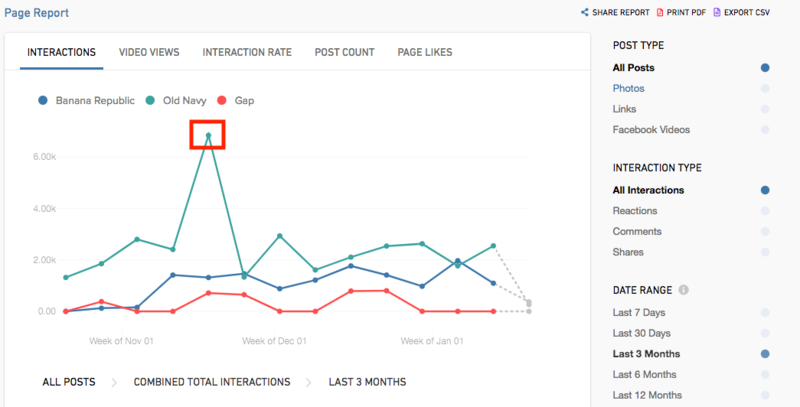 Pro-tip: you can click on the peaks in the graph to see exactly what post drove engagement on the page. Widen your audience funnel by monitoring your content with high Interaction Rates. Use Interaction Rate as a proxy for community engagement - what's resonating with your page's core audience. Create a saved post list that includes examples of high interaction rates (and another that includes examples of low interaction rates). Study the post lists to understand patterns and begin optimizing your content to maximize interaction rate for your loyal community. Track video performance and measure which videos resonate with your audience. This will help you optimize for ads, so you can spend your budget smarter. Use Leaderboards or Intelligence to see how video content is working on your page or other brands to discover opportunities. Pro tip: use these numbers for sales to sell off of. Sort by the branded content filter on Facebook to see what's performing for brands and marketers you work with. This could also help sales teams understand the organic strategy of your clients or potential clients.